The route leads through a magnificent mountain area, past villages of the Thakuri, along rivers and across the Nara Lagna Pass. From the 4580m high pass you can see the vast Tibetan plateau. You will hike to the Nepali/Tibetan border till the village of Sherpa on the Tibetan side, where a vehicle will pick you up and drive to Taklakot. 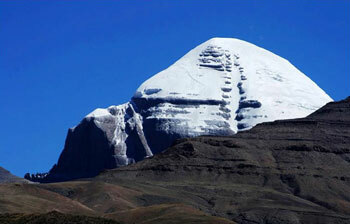 Geographically you are directly south of Kailash, which Hindus and Buddhists view as the "center of the world". On your way to the holy mountain you will wander along the western shore of Lake Mansarowar and camp. "There are countless beautiful landscapes in the Himalayas, in the Trans-Himalya and in ther ares of high Asia, Yet the view from Gosul Gompa cross the lake and the surrounding mountains surpasses everything I have seen", wrote Sven Hedin in "Transhimalaya" (1909). The mighty rock dome of Kailash comes closer. Together with pilgrims from far and wide you follow the trail (Parikrama) across the Dolma La (5600m), which is adorned with countless prayer flags. It takes three days to circumambulate the snow-covered cupola of the 6714m tall mountain. In Tibetan tradition you will conclude this pilgrimage in Tirthapuri - which is one of the most important pilgrim destinations along with Kailash and Lake Mansarowar. Almost surreal appears the canyon-like valley of the Sutlej. Imbedded lie the ruins of Tsaparang, the capital of the former kingdom of Guge. After visiting the 900 year-old site our drive through the canyon of the Sutlej starts long the north route to Lhasa. The light and shadows of the summer clouds make for a magical atmosphere, dip the barren vastness in tinges of pastel green, yellow deep blue and violet. En route, we visit two of the most sacred temples of Tibet: Tshilunpo in Shigatse and Kumbum in Gyantse. In Lhasa, the spiritual and secular center Tibet's, visited by many pilgrims from allover the country, we will have two days at our disposal. Day 12 Holy-Manasarovara: At 14950-ft/ 4558m. Day 17 Drive to Paryang (277km) 7-8 hr. Day 19: Drive to Kerungm (2700m). Day 20: Drive to Kathmandu (1300m).